The hardest part of any HSC Visual Arts major work is undoubtedly coming up with an idea. With so many different topics, techniques, materials and styles to choose from it can be super overwhelming to even think about what you might do for your visual arts major work. While we can’t guarantee that by the end of this article you’ll know exactly what you’re doing and how, we can say that the following steps will help you take huge steps towards some awesome ideas. The quickest way to get on the track to an awesome idea for your HSC Visual Arts Major Work is through categorisation and elimination, so let’s get to it! Step 1: Technical or conceptual? High ranking visual arts major works almost always fit into one of two categories; technical excellence or conceptual depth. That’s not to say that these are the make-or-break of major works, but knowing which of the two you’re aiming for is a great place to start when it comes to developing ideas. Before we get ahead of ourselves though, we need to know what each is. These are artworks that show amazing use of artistic skills, styles, materials and mediums. If you can paint like Van Gogh or draw like Da Vinci this is probably the category for you, as it’s all focussed on the technical skills you show in your artworks. These works can still have strong concepts, but they’re the kind of works where you notice the skill before you notice the idea. These works are the ones that really make you think. They have a really strong idea and represent that idea really well, making it easy for audiences to quickly figure out what the work is about and how the artist feels. All artworks have some kind of concept/idea behind them, but works of conceptual depth usually portray a more complex concept in a beautiful, confronting or technically talented way. In the end most artworks can and do cross over these two categories, with many Band 6 major works featuring technical skill and strong concepts. The point of breaking the categories apart is to make it easier to start building your idea out of what you already know. Ask yourself; do you already have some serious skill with a particular art style or medium? Or do you prefer your works to make a major statement? If you went technical it’s best to plan your major work around how you’re going to best showcase your technical abilities. If you went with conceptual, focus more on what is really going to get your message across in terms of materials, styles, etc. If you can’t decide or you feel like you’re already overlapping, then that’s okay too! Just remember that if you focus too much on the technical side your concept may get a little lost, and if you go too conceptual you make not show off your technical skills as much as you like. It’s a real balancing act, but if you set your mind to it you can achieve it! I personally was more of a technical skills kid, so I knew straight away that whatever I did for my major work was going to have to fit with my drawing abilities, which were my strongest skill. In the end my works had a pretty solid concept to them as well, but because the focus was more on showing off my technical abilities I didn’t worry too much about how easy it was for audiences to ‘get’ my concept. In the end this meant that I had a beautiful and technically advanced major work, but I had to rely on my artist statement to get my idea across. Step 2: Social issue, art world or personal? Now that you know whether you’re focussing on technical skill or conceptual depth it’s time to start narrowing down where you’re going to draw your idea from. Again, it’s easiest to break down some key categories and eliminate the ones that you’re less interested in! Major works for visual arts tend to fit into three main idea categories, though some may fall outside of them. The categories are social issues, the art world and personal interest. It feels like every other major work these days is a commentary on some sort of social issue – and that isn’t a bad thing! These works often take on difficult or major world issues and events and give some sort of comment on them, often making the works emotional and exciting. However because social issues have become such common subjects, it’s really hard to make sure your idea is totally original. The likelihood that someone else has already made an artwork just like yours focused on the same social issue is pretty high, so you need to make sure you set your work apart. You can do this in several ways, and what you choose is totally up to you! 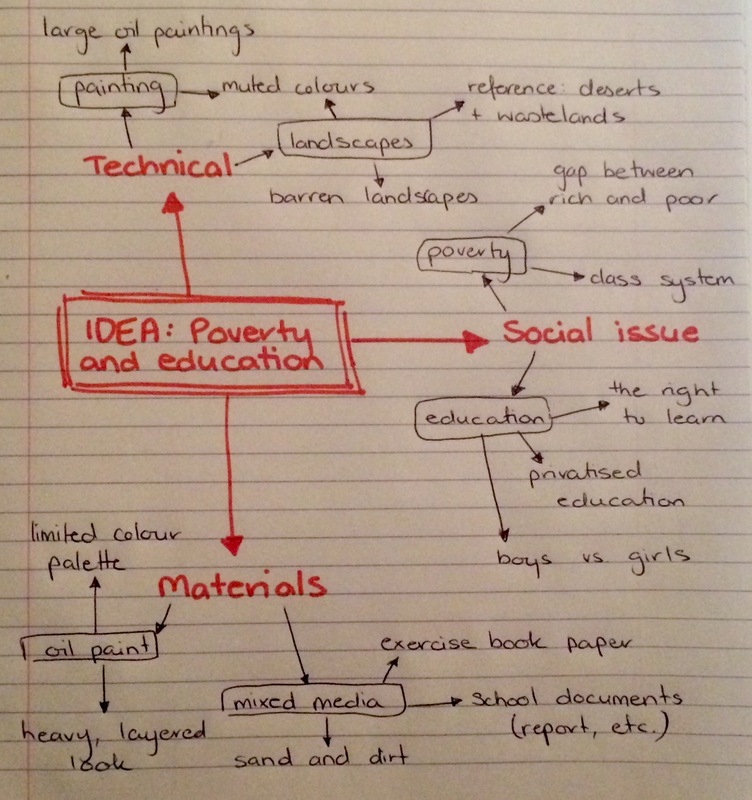 You can try to turn your social issue idea into a ‘technical excellence’ work, you can make your work abstract or surreal, you can look at specific cases of the social issue or try new mediums and art styles. It’s all about making sure your work is totally unique to you! The other thing to remember about social issues is that, because they’re issues everyone knows about (and usually has opinions on) you have to be careful with what you say and make. Always be careful to make sure your work doesn’t become racist, sexist, or discriminatory in some other way for the sake of being ‘controversial’. If you’re focussing on an issue like mental illness remember that these things affect real people, and unless you have firsthand experience with the issue, it’s not your place to make judgements. Works about the art world are slightly similar to social issues, as they’re generally made to make a statement or comment, however this time it’s specific to something to do with art. Most of the time ideas focused on the art world look at some form of art history and highlight something about it – a specific style, era or issue. These works can be a little harder for outside audiences to understand, as you usually need some knowledge of the art world to really appreciate the comments being made in the art. For example, you may want to make a work about why most religious art depicts Jesus and Mary as white-skinned and blue-eyed when in fact they were middle-eastern (Jesus was born near Jerusalem). This is an idea that requires audiences to have some knowledge of famous Christian artworks and why that’s important or questionable in the art community. This is only one example, but a lot of works that have an idea based on the art world often also cross into social issue ideas (in this case racism). Something to keep in mind when creating major works about the art world is that in order to make art about a subject, you have to really know and understand it. This means you’ll have to do some serious research and documentation, as well as referencing artists and their artworks. Of course, it also lends itself really well to appropriation and creating postmodern major works, which tend to mark well when done right! These works and generally the ones with the greatest range of skill level, success and overall marks. When you create a work based purely on one of your own personal interests you have the awesome benefit of working with an idea or subject that you already know and love, making it easier to get motivated and keep going. Where this can let you down however is when you lose the line between what you like and what actually works. The best way to explain this is with my own story. My major work was entirely based on a personal interest in ‘dead’ pagan religions, which is a concept that I probably could have taken pretty far. I already knew I was focusing on my drawing skills, so I decided on creating four large portraits of my interpretations of ‘dead gods’. I made some beautiful drawings of the two main deities of ancient Greek and ancient Norse paganism, and at the end of the day I loved my major work and thought it was awesome – and it was! But not that many people have an interest in ancient pagan religions, and even those who do weren’t necessarily going to recognise my interpretations of old gods for what they were. This meant that even though my drawings were awesome, my personal interest had made me forget that my audience had to understand what I was drawing too, leaving me to rely on my artist statement to explain my concept. At the end of the day I got pretty good marks, and I’m still really proud of what I made, but I can also recognise that having a pretty obscure personal interest for my topic probably didn’t do me too many favours. If I had managed my work better and been able to step back and say “Okay, what can I do to make my concept clearer?” then my works may have been more successful. This isn’t to say that choosing a personal interest is a bad idea – I honestly don’t think my marks would have been as good if I hadn’t chosen a topic I knew and loved. However you always have to be careful that your concept doesn’t get lost because you forget that your audience may not understand what your artwork is about. The best way to combat this is to always get the opinions of your friends, family and teachers and really take on the constructive criticism they provide! These three aren’t the only topics that people focus on for there major works, and there’s nothing saying that you have to choose one of them. 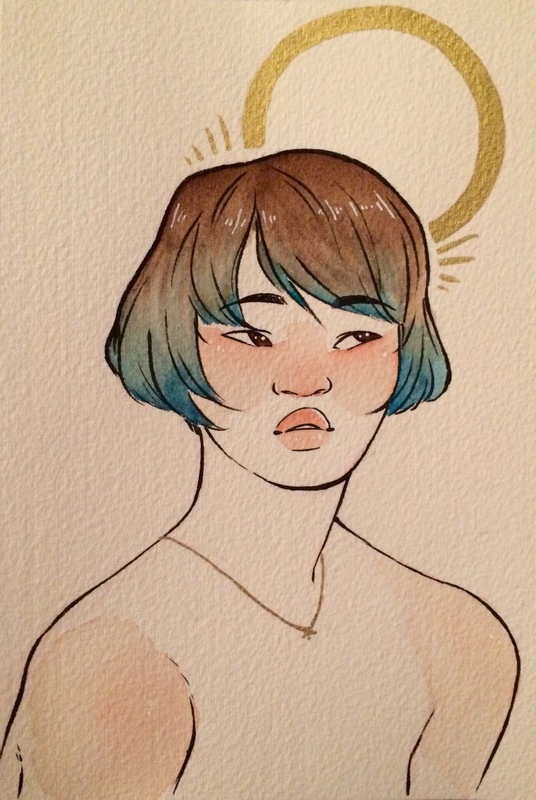 However what they can do is help you narrow down what you do or don’t want to make art about! If you know you don’t want to deal with the research involved in an art world work then you can cross that category off your list. Likewise, if there’s a social issue close to your heart then maybe you can start to consider what art you could make about it. In the end, it’s always your choice! So which topic type are you going to go for? Let us know in the comments! Generally this step is pretty easy to get into, as by year 12 you’ll have a good idea of what you do and don’t like to work with artistically! By now you’ll have an idea of what you’re going to be focusing on in your major work, as well as what your subject matter might be, so it’s time to thing about the structural stuff. These lists will basically cover every style, medium and process you may potentially work with, allowing you to see exactly what’s on the table. Then it’s simply a case of trying them out and seeing which ones do and don’t work for you, highlighting them or crossing them off as you go. From there you can start collecting images or references for the ‘Like’ column (we’ll talk more about this in the next step) and begin experimenting with things in your ‘Try’ column! Your experiments may be as simple as swatching a few new colour palettes or fiddling with some clay, to as complex as creating a whole artwork to try out a certain style or mix of things! Here we have one full image experimenting with the cartoon style and limited colour palettes from the ‘like’ column, as well as watercolours and thick line work from the ‘try’ column. The whole idea of this step is to get you thinking about the actual physical artwork and how you plan to make it, with steps 1 and 2 focusing more on the concepts and ideas. Plus you don’t have to do this step all at once – in fact we recommend you keep adding to your lists and trying things out all the way through your major work. You never know what you’ll discover that could turn your average major work into an awesome one! By now you should know your category (technical or conceptual), your topic (social issue, art world, personal interest or other) and have an awesome list of techniques and materials you know, love or want to try. So it’s time to bring these all together and brainstorm just what your major work is going to be! Having worked through the previous steps you probably already have a few little (or big!) ideas in your head that you can immediately jot down and begin to work with. I find that mind maps are the best way to explore these ideas, because you can look at exactly how they fit in with the choices you made in the first three steps. This is what just one of several idea mind maps could look like, showing exactly how the concept connects to the three previous steps and what you could do to tie them all together. At this point it’s all about what you want, so don’t think that you have to follow any set rules in how you brainstorm! If you’d rather work with dot-points, diagrams or illustrated ideas then go for it – whatever gets your creative juices flowing and helps you work out where each idea could go. You may end up with pages upon pages of ideas or just a few detailed ones, either is okay! Once you’ve brainstormed, choose a few ideas or one that really stands out and start some preliminary research. Don’t worry, I’m not talking about a 40 page word document with a full Harvard formatted bibliography! This research is more about getting inspiration and references that you can use to start developing and visualising your idea in order to get a better picture of it in your mind. Generally this is as simple as going to google and starting to look up artists, artworks, styles and techniques that you like or plan to use and going from there. You can collect all the things you find as bookmarks or in a folder on your laptop, but I’ve found Pinterest to be the best for organising your research! Creating an account is free and easy, then you can get straight to creating a ‘board’ or collection of things you find around the internet that you like. This way you can keep them all in one place and just ‘pin them’ as you go! 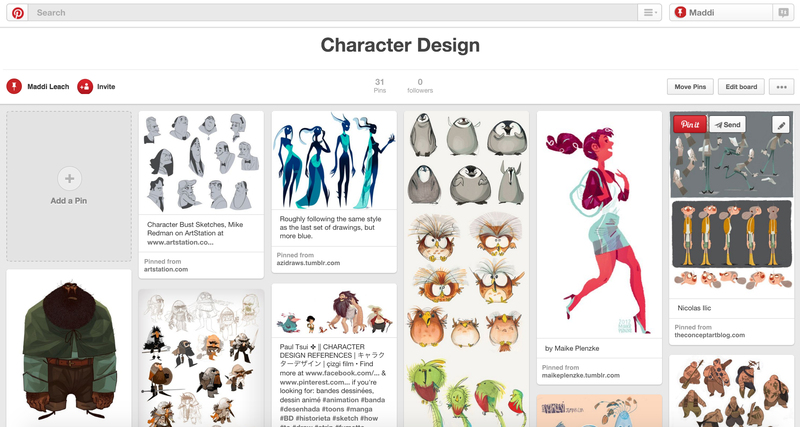 Here’s a board full of different styles and ideas that link to character design, which would be a great way to collect inspiration if you were planning to develop your own characters for your major work! At the end of the day your brainstorming and research is what you’re going to present to your teacher when you pitch your major work idea to them, so making sure you have some visual references is super helpful. Plus you’ll get heaps of new ideas for different techniques or styles the more you research existing ones! And there you have it; you’re ready to start pitching your idea to your art teacher and get started on your major work! You have a clear idea of whether you’ll go technical or conceptual, as well as knowing whether social issues, art world, personal interest or something else is going to be your go-to topic. Plus you’ve made some killer lists of style and material possibilities, as well as great idea mindmaps and pinterest boards to really pitch your concepts. You’re just about ready to go! Now you may be thinking; “Hang on, you haven’t told me any actual ideas yet!” but that’s not the point of this article. No one can just ‘give’ you an idea for your visual arts major work. Sure, people can mention artists or artworks that will inspire you, or lead you down trains of thought that could turn into an idea, but at the end of the day your work has to come from you! By following the steps set out here you can turn the ‘um’s and ‘ah’s of waiting for inspiration to hit into a more streamlined process and get some creative gears going, but when it comes down to it only you can decide what your major work will be.